The Skyrim Thieves Guild secret entrance in Riften. The Thieves Guild is the headquarters of the Thieves Guild located with the sewers beneath Riften, known as The Ratway. The headquarters are based within The Ragged Flagon - Cistern and a bar named The Ragged Flagon for full details of these places see their individual pages. # Non Thieves Guild quests. †† Other Thieves Guild quests exist, but do not require you to enter The Ragged Flagon or cistern. There are two entrances to the headquarters one via the Ratway into The Ragged Flagon and a second directly into The Ragged Flagon - Cistern hidden beneath a tomb that dominates the small graveyard to the east of Riften's Hall of the Dead. You can only access the second entrance once you have joined the guild and completed Taking Care of Business. To enter the headquarters using this entrance, press a small button in the center of the tomb, this opens a secret stone staircase. Descend it and open the sewer covering. To exit directly from the cistern, climb the ladder in the alcove to the southwest and then pull a chain to retract the tomb. 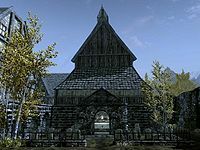 As you progress the Thieves Guild questline, complete reputation quests for Delvin Mallory and complete misc quests, the headquarters will be upgraded and additional thieves will move in. An extra room is added to the flagon by the Unofficial Skyrim Patch. This room is located directly left of the door leading to the Ratway Vaults. It is mainly filled with beds for the those who live in the flagon, and is mistakenly blocked off by a wall in the vanilla game. The special features within The Ragged Flagged only appear as the extra merchant move in after completing the required reputation quests. There is a "Guild" Shadowmark to the left of the entrance door from the Ratway Vaults. Esta página foi modificada pela última vez à(s) 12h51min de 18 de novembro de 2014.